This week the Sites Consultation documentations was published on the TDC web-site. These will form the basis for a second stage of consultation. This second consultation will give residents an opportunity to comment on sites being assessed as part of the plan. Monday I suggested some tweaks to the TDC web-site so that residents in two clicks from the home page could find the sites consultation document. Each site contains two pages and the appendices at the back include overview maps for wards and the district. Tuesday evening Resources committee was always going to be tricky. We are running along three different but parallel railways tracks and debate was always going to jump across from one to another. As part of the Local Plan process we need to review the sites which the Council owns. The Inspector when he reviews the Local Plan will expect us to have done this work. Officers reviewed 128 Council owned sites for development potential, put 12 forward in the Resources report and after considering evidence from Local ward members we removed two and made three others conditional so we now have 10 sites in the consultation. Statements were made we were selling off Green Belt for financial reasons. 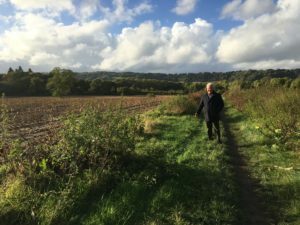 Exceptional circumstances is the only basis for changing the Green Belt boundaries and raising money is not one of them. Therefore, this cannot, by definition, be the Council’s financial strategy. The Green Belt assessment has been carried out and apart from isolated sites such as Clacket Lane, Hobbs and Lambs Business Parks, the vast majority of our Green Belt meets at least one of the five purposes of the Green Belt which gives added protection and is good evidence to lay before an inspector. We want to conserve the Green Belt and character of our area and not build houses on unsuitable sites. However the Local Plan process makes it clear that it has to be positively prepared on a strategy which seeks to meet objectively assessed development and infrastructure requirements. Thursday I made a concerted effort to get my Facebook page and Blog ready to go live as I want to achieve this at the weekend. A friend gave me some much needed support and we managed to make the text wrap around the pictures. Still have not cracked how to stop my Facebook page grabbing a picture of Big Ben from the Blog and turning it on its side. It is surprising how much time can be spent trying to sort these type of problems. On Friday I read that Guildford has put its Local Plan process back a year. They were about nine months ahead of us as they hoped to get their plan agreed this year ready for Inspection in 2017. I had met with Paul Spooner their leader in August and had discussed their strategy of pursing a number of new settlements linked to some big infrastructure improvements. I knew he was having trouble getting agreement to the A3, trunk road, upgraded as part of his infrastructure need. I was surprised to learn that Guildford Green Belt was 89% almost as high as ours at 94%. Guildford’s Objectively Assessed housing Need (OAN) is 13,860 compared to TDC 9,400. I took to Paul who clearly had an excellent grasp of his Local Plan. He was quite open with his criticism of the whole bureaucratic, lengthy, contradictory process as set out in the National Planning Policy Framework 2012. (NPPF). It was Localism, until you went in front of a Government Inspector, and we are all only too aware of the Waverly experiences. In March 2013 Waverly presented their Local Plan to the Inspector. It was rejected on the first day as not having a realistic OAN, not proper consultation and no Green Belt assessment! The result was loss of control over development and this district at the west end of Surrey experienced an open-season for unwanted development. They have now done a Green Belt assessment and have an OAN of 10,380 and await their next inspectors visit. Paul described the whole process as “a shocking waste of public money” I asked him if I could quote him on this and his immediate response was Yes – so I have!